From construction to agricultural equipment and the vocational truck industry, motors can essentially be used for any application requiring rotary power including food-processing equipment, augers and countless others which impact our daily lives. Not all applications require rotary power and therefore the use of a motor, but for those applications requiring low speeds and high torque – such as rotating a cement mixer to pour concrete or a feed spreader distributing seed to plant crops – a low-speed, high-torque motor will be essential. This is because within these types of applications, the load being placed upon the equipment is very heavy and thus, requires a greater amount of torque to start up from its stationary position and to operate at lower speeds. In these instances, more torque is required than a typical gear pump can provide. To generate the torque required for these low-speed, high-torque applications, a motor is used encompassing a rotor assembly with either a gerotor or roller gerotor design. As a result, it’s important to understand these two designs to determine the option best suited for the requirements of the given application. Motors with a gerotor design are smaller, more compact in size and typically used for light-duty and low-pressure applications. Within this type of motor design, the rotor assembly consists of a stationary ring called the stator and a moving, planetary gear – the rotor. The stator is machined into the metal housing, which the rotor – a star-shaped gear – sets into, and its wall utilized to form the motor’s displacement chambers. As the oil enters the rotor assembly within a gerotor design, passing through the pressure zones from high to low, it forces the rotor to turn within the stator – moving against one another – to convert the fluid power into rotary power as torque. While the gerotor design can suit the needs of various applications and is an economical option, it does have a looser tolerance and cannot force the gear as hard due to the gaps naturally resulting from how the stator and rotor fit together. These gaps allow more oil to pass from high to low pressure, resulting in greater slippage and less converted torque. The rotor and stator moving against one another within the gerotor design can lead to wear over time, which is why for medium/heavy-duty and high–pressure applications requiring a more robust option there is a roller gerotor design. A roller gerotor design functions the same as a gerotor design as oil forces the rotor to turn within the stator converting fluid power into rotary power as torque; however, there is one main difference within the rotor assembly. Instead of using the stator’s wall, the roller gerotor design incorporates roller pins to form the displacement chambers. Its these roller pins that eliminate the gaps found within the gerotor design for a tighter fit and tighter tolerance, allowing less oil to pass through in order to force the gear harder and ultimately convert more torque. Motors featuring a roller gerotor design are more robust, built to better withstand wear and traditionally last longer and perform better; however, there is an added cost associated with these benefits. For this reason, it’s imperative to weigh all the available options – having a clear understanding of the low-speed, high-torque application’s requirements and the two types of motor design before making a purchase. In the end, you may find that the gerotor design – an economical alternative – is all that’s needed or the more robust, roller gerotor design’s benefits outweigh the added cost. Muncie Power Products line of low-speed, high-torque motors is comprised of three series – the MB, MH and MJ. Amongst the three series, there are 39 different displacement sizes with all featuring shaft and mounting options to match common SAE standards. The MB Series features a compact body and low-port profile – good for limited space applications. By itself, the series has 13 different displacement sizes, features built-in check valves, utilizes a spool valve design and has a gerotor design as an economical alternative. A combination of the MB and MJ Series, is the MH Series low-speed, high-torque motor. The MH Series features 16 different displacement sizes, a spool valve design, three-pressure zone design and roller gerotor design for smooth performance, high efficiency and durability for low-speed operation. 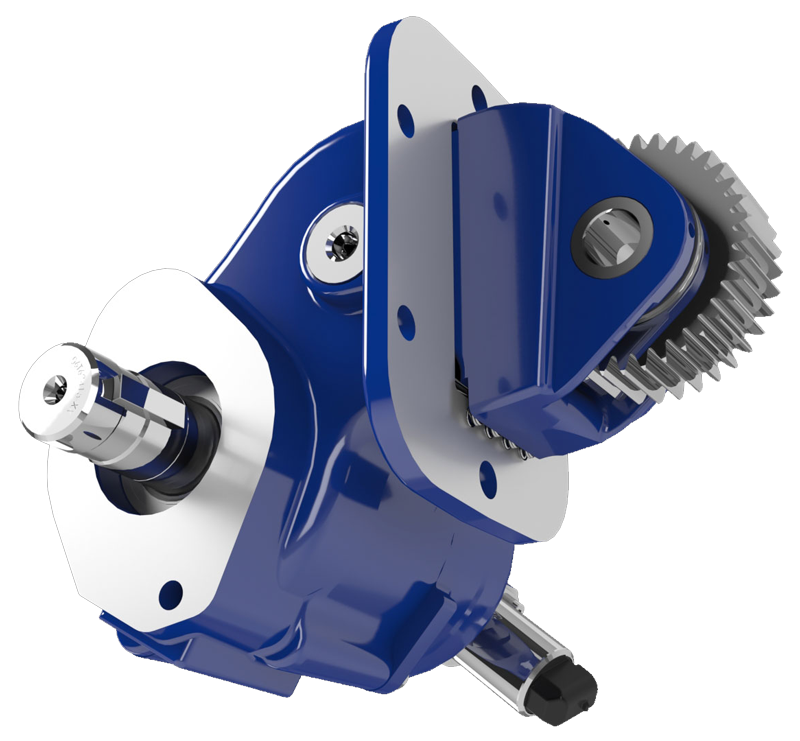 For heavy-duty applications requiring a more robust low-speed, high-torque motor, the MJ Series meets these requirements with a roller gerotor design, heavy-duty roller bearings, a heavy-duty drive link and three-zone commutator valve for higher flows and higher pressure applications.